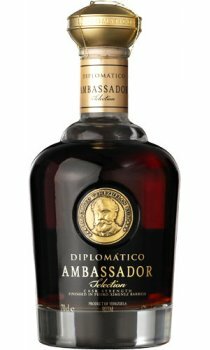 Diplomatico Ambassador Selection has been created by Rum Master Tito Cordero, only the 3rd Rum Master in the history of USA. Crafted from 100% heavy pot still rums and aged for a minimum of 12 years, the rum is aged in ex-bourbon casks and then finished for an additional 2 years in Pedro Ximenez sherry casks. Not only does it contain no sweeteners, caramel or other additives, its high strength (47% ABV) also means it does not require chill-filtration. This ensures that fatty acids which contribute to the mouth feel and flavour are not removed during the filtration process, allowing for the exceptionally smooth finish. On the palate the characters from the aroma persist but give way to a powerful, complex combination of dark chocolate, aged dried fruit, coffee and vanilla, all with a lovely creamy mouth feel.